Dory is swimming around in her usual state of la-la-land. The school of fish, voiced by John Ratzenberger, are rushing towards her in the shape of a speed boat. The fish say, "Hey lady, you better get out of here, there's a shark coming!" Dory: "A shark? What's a shark?" 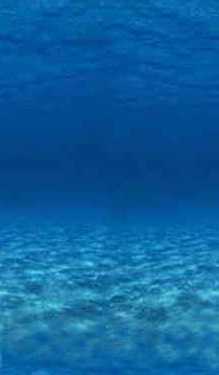 We see Chum coming towards us and all the fish swimming away in fear. Chum does not have the hook through his nose that he did in the first movie. Dory: "I wonder why all those fish are so scared of him? It must be fun to scare everyone! I want to be a shark too." Dory swims right up to Chum and says, "Hi!" Chum asks Dory why she's not afraid of him. Dory: "Why should I be afraid of you?" Chum: "Because I'm a shark!" 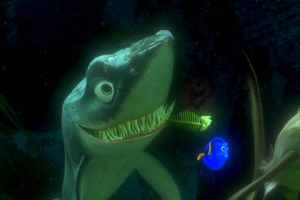 Dory: "Well maybe I'm a shark too!" Chum: "You don't look like a shark. You look like food! Sharks like me eat fish like you!" Dory: Eat fish? Noooooo! Fish are friends not food!....gee that sounds familiar! Throughout the number, we see Chum unsuccessfully trying to eat an oblivious Dory who just keeps singing. He also tries to eat an eel getting shocked and an octopus getting ink in his eyes. At the end of the song, Chum sees a fish hanging nearby on a hook and quickly chomps down, breaking the line. The hook goes through his nose and Chum cries out in pain. He swims off quickly chanting, "Fish are friends, not food," over and over. "Gee," Dory says to herself, "Being a shark sure seems painful....I guess I should be something else."